Put the flour and butter into a food mixer. Mix until a grainy consistency is reached. Blend in the yolks, powdered sugar, vanilla essence till a uniform mixture is formed. The dough for the pastiera’s crust is ready. Wrap the dough in cling-film and let it rest in the fridge for 2 hours. Meanwhile mix the ricotta with the sugar in a bowl. Mix well till the sugar is properly incorporated into the ricotta. Add in rest of the ingredients under “For Filling”. The filling for pastiera is ready. Roll out the rested dough to a thickness of 0.2 inch. Line the cake pan with the rolled out dough, similar to pie’s crust. Prick the crust all over with a fork for uniform cooking. Fill in the pastiera filling into the dough lined cake pan, to the brim. Make long rectangular dough strips and lay them crisscross across the top of the cake like a fruit flan. 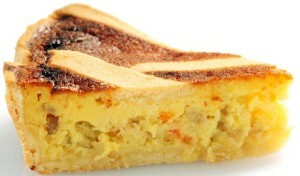 Bake the pastiera at 180° C for about 1 hour and 30 minutes. Remove and cool on a wire rack to room temperature or chill it overninght. Pastiera is ready to be served. Cut the pastiera into wedges and serve. If you have any queries regarding the Pastiera recipe, please leave a comment.